-cost of nano car ? 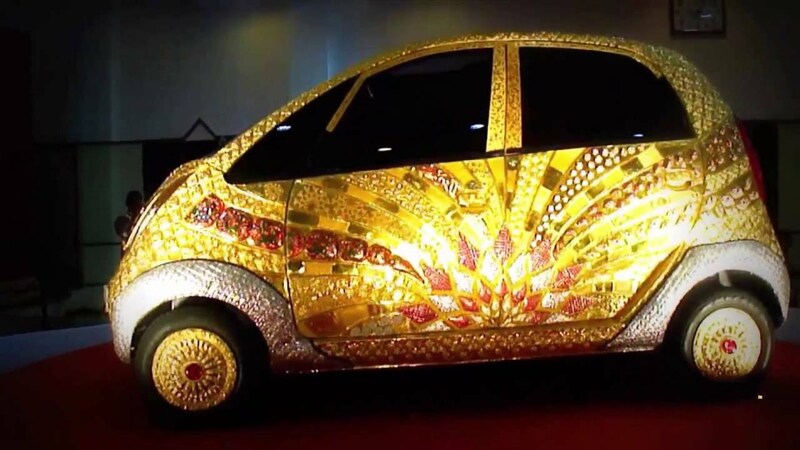 Tata Group Monday unveiled a Nano car – made with gold and silver, and studded with precious stones ,worth an astronomical over Rs.22 crore. But, it’s not for sale – the valuable and fully functional car is a unique branding and promotional initiative by Goldplus Jewellery, part of Titan Industries, a Tata Group company, an official said. The mega-value Goldplus Nano Car was unveiled Monday evening by Tata Group chairman Ratan Tata. The Goldplus Nano Car is billed as the world’s first ever gold jewellery car and celebrates the 5,000 years of jewellery making industry in India. The car’s body is made with 80 kg 22 carat solid gold, 15 kg silver, precious stones – including diamonds, rubies – and other expensive gemstones, the official said. “As many as 14 techniques of jewellery making have gone behind the effort — from the intricate filigree work to the delicate and colourful meenakari work, the stunning kundan to the traditional naqashi…marking the convergence of diverse and culturally distinct jewellery making techniques from around India,” the official told IANS. Titan Industries managing director Bhaskar Bhat said that since eternity, jewellery made with gold and precious stones has been an integral part of the Indian woman’s life. “Indian jewellery has been an epitome of innovation and creativity, and carved a niche worldwide for itself for the intricacy of the designs crafted out of the precious metals and stones,” said C.K. Venkataraman, COO, jewellery division. After its glittering launch in Mumbai Monday evening, the Goldplus Nano Car will travel to all the Goldplus showrooms at 29 locations around the country. The gold car incorporates beautiful designs, made with the precious stones of different colours, set on the gold and silver body of the car.This gold car very much demand in dubai .